In my last article, I’ve shown you how to write a Solidity ERC20 Token for the RSK Mainnet, how to import and use OpenZeppelin libraries and contracts, and how to use Truffle to deploy and interact with our contract. For that reason, and for the safety of the few SBTC that I had left, I added the suicide function to the contract in case something went wrong while doing the article. The second problem appeared when I tried to interact with the already deployed contract. While sending a transaction, Truffle sends the body of it to the node with the data and the rest of the parameters (as I watched live in the rsk.log file). However, after twenty minutes the transaction was never included in any block and neither the receipt, nor its hash, were known to the node. The way I worked around this was to configure the cors parameter in the node.conf file to allow Metamask to connect to the node. Then, the transaction was sent by encoding the function in question and its parameters to a hex string and entered in the data field. After sending it with the same nonce value as the transaction sent with Truffle, it was finally included. Don’t get me wrong, the Truffle suite is a great tool for developers, but if you can’t live with some problems every now and then while developing smart contracts, stay focused and continue reading. The tool that I’ll be discussing here is the Python version of Web3: Web3.py. In this article we’ll be discussing deployment and interaction of the same ERC20 Token contract used in the last article, to compare the usability with both tools. Since rskj 4.2, the RSK Testnet is back online. For that reason, and because we couldn’t use it before, we are going to deploy and test our contracts on that network for this article. You shouldn’t have any errors. We are going to use the Test network to deploy our contracts, so feel free to check again the first article in which we’ve discussed how to change networks (and change it yourself! ; ) ). Now, we have a suitable environment to start our scripts. 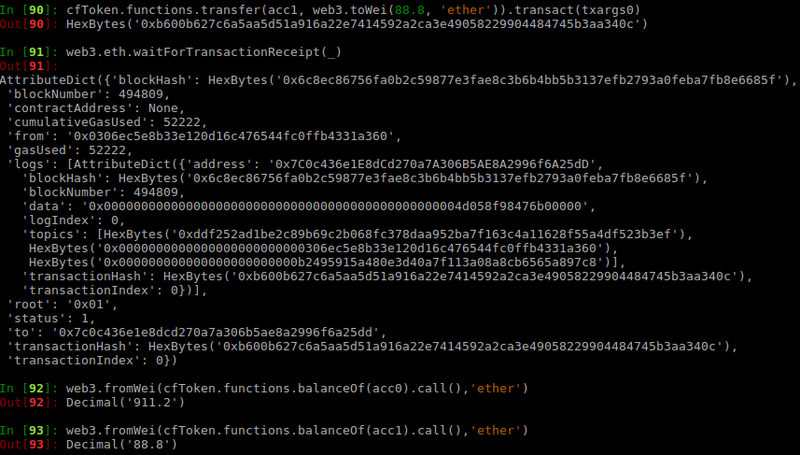 where <contract>.sol is the Solidity code file and <output-dir> is where our built ABIs and bytecodes files will be. where MACHINE and PORT are the IP, or name, and port that we’ve assigned in the node.conf file. By default, it’s localhost:4444. Now, we proceed to deploy the contract. Inside the Compiled folder we find not only the ABI and bytecode of our contract, but also its compiled dependencies. Nevertheless, we only need the ones from the main contract. We save the hash of the transaction for two reasons: to check the status, address and more parameters, and because we can use it with the function waitForTransactionReceipt to know when the contract is mined. After that, our contract will be written into the blockchain. 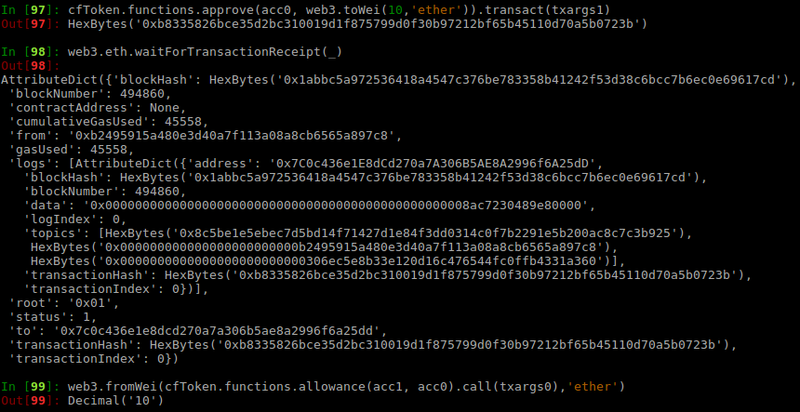 This means that we can deploy the contract in one line like with Truffle (but knowing what it does! =D ). Our deployed Token contract of the Test network is now at 0x7C0c436e1E8dCd270a7A306B5AE8A2996f6A25dD . Where FUNC_CALL is a callable function of the contract that doesn’t modify the blockchain. 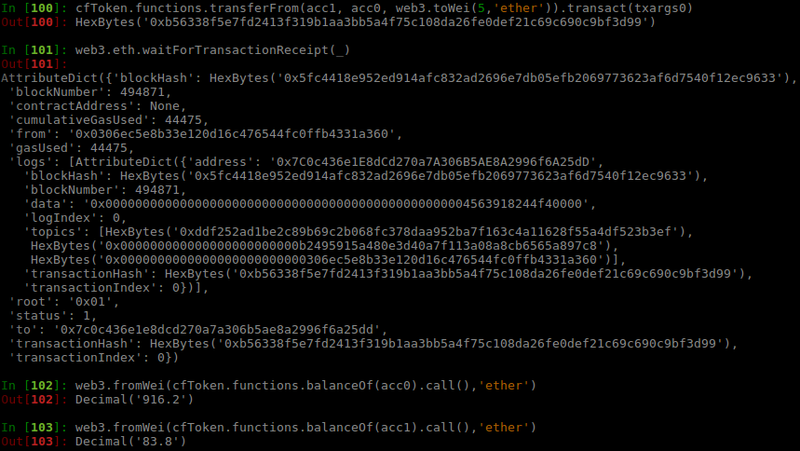 So, as before, if we try to modify the variable without being the owner, acc1, the transaction is unsuccessful. We see that the status gives us a successful operation. We see that the transaction was successful, as expected. This will warn us that we did something wrong or that the function doesn’t exist. Write automatic Python scripts to load the compiled contract and deploy. We saw that the syntax of both tools are alike. Truffle is easier to use from scratch because putting the contract code in Solidity is enough to make it deployable from the suite. With two simple commands, your Smart Contract is ready to go. But because we had issues using the Truffle suite when we sent transactions, a change was needed. The Web3.py implementation is way better for a developer at the time of writing. Not only did it retrieve the funds from a stuck account made in Truffle, but also has a newer version of Web3 and allows non-trivial scripts to be executed. Operations in Truffle may sometimes be more complex than necessary. Yes, maybe you need to set up more packages and libraries from the start, not taking into account that you need to compile the code yourself, but in the long run it seemed to me that this tool was more stable than Truffle to develop contracts.